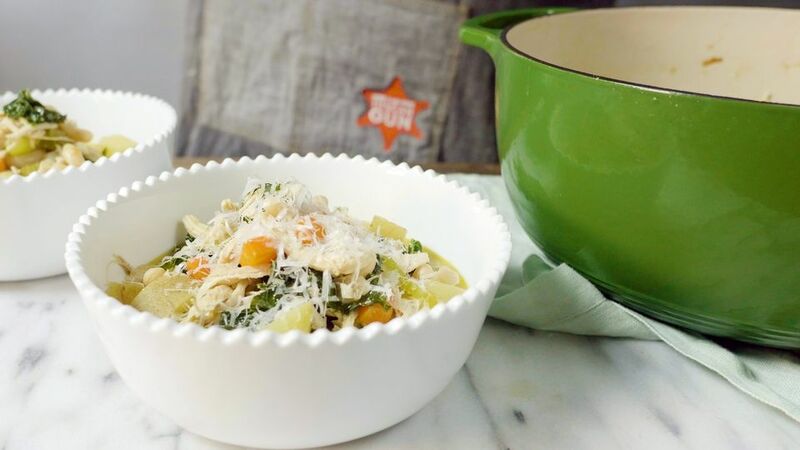 Get your comfort with some Italian countryside flair in this nourishing chicken soup recipe. Packed with veggies, plus tender chicken and cannellini beans, the rustic soup is hearty enough to take center stage at the dinner table. Top it off with fresh herbs like thyme, plus grated Parmesan cheese, and you’re living la vita dolce. Heat the oil in a large saucepan over medium heat. Add the carrots, celery and onion and cook until softened. Add the garlic and thyme and cook until fragrant, about 2 minutes. Add the potatoes, chicken stock and some salt and pepper. Raise the heat and bring to a boil. Lower the heat and simmer for about 20 minutes until the potatoes are cooked through. Add the beans and cook for about 5 minutes. Add the shredded chicken and cook for 2-3 minutes. Add the kale. Raise a heat a bit to make sure the pot is at a simmer. Cook for a few minutes until the kale is wilted. Taste and season with salt and pepper to taste. To serve, top with grated parmesan cheese, a crusty piece of bread and fresh parsley or thyme based on your preference.